Will came up with an fantastic idea for a fun family activity this week. He wanted to watch a movie outside one evening so we took our small television with a built-in dvd player outside and made it happen! We popped a big bowl of popcorn, but we also made Rae's S'more Pops, a fun twist on traditional s'mores! You stick large marshmallows on lollipop sticks (or a plastic fork in our case) and dip in melted chocolate (I melted Hershey's milk chocolate chips in the microwave) and then dip in crushed graham crackers. Easy, fun, and yummy! Thanks for such a great idea, Rae! This was such a simple idea for big fun. All five of us, six if you include Jack-the-Fat-Beagle, sat under the stars on a perfect summer night watching one of our favorite movies. I'm going to be soooooo sad when summer ends. Were you a fun mom this week? I know you guys are fun because I read your blogs and you inspire me all the time! Link up here with your own fun idea. Moriah happens to be a real-life friend of mine, but you don't have to know her (or even read her blog regularly) to link up! That looks like so much fun!!! And those smore pops? Ingenious. How fun! I love it, Meredith! I've been trying to figure out how to do an outdoor movie...looks like such fun. And the smore pops look wonderful! Great thinking using the forks!! Who needs lollipop sticks when plastic forks are always available? You really are a super fun mom!!! What a great "fun mom" thing to do--looks like so much fun!!! I love this idea -- but will have to wait until fall to sit outside for a movie. :) I'm jealous of your "blanket necessary" weather. You are most definitely a FUN MOM!! That is such a fantastic idea! I love how you creatively make memories for your kids! That looks like such fun!! We've also done it before by buying a projector, projecting a movie up on a large sheet on the side of our house and swimming in the pool while watching a movie! So fun! Fun!! I will have to remember this when our weather gets a little cooler. Those s'more pops are genius! I've never liked s'mores because the chocolate won't melt. I don't know why this never occurred to me! Although now I'm thinking I could just mix melted choc chips in a jar of marshmallow creme and and spread it on graham crackers. Or eat it with a spoon. Whatever. love the s'more pops! i think i'll have to try that with my teenagers. 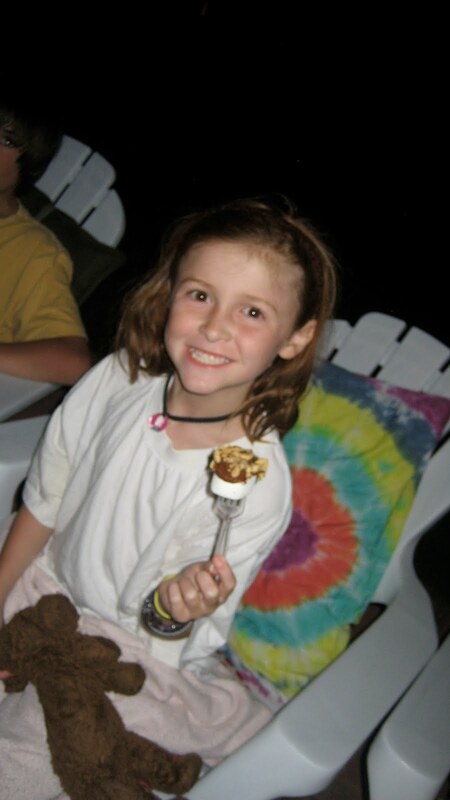 Lurving the s'mores on a stick. Absolutely lurving.